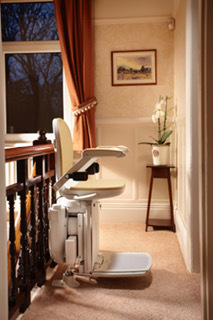 Brooks 180 Curved Stairlift - Manchester Stairlifts - High quality stairlifts in the Manchester area. Our high quality service and affordable prices make us one the best value Brooks 180 curved stairlift suppliers in the UK. Our Brooks 180 curved stairlift prices are fully inclusive and come with 12 months warranty as standard with extended warranties available. EXPRESS DELIVERY and Installation of within 3-6 working days from survey is available on this model which can be beneficial for customers that require a stairlift fast. Slimmest curved stairlift: The Brooks 180 curved stairlift is currently the slimmest curved stairlift on the market so is perfect for narrow staircases and for customers that are conscientious about space – it can be installed on staircases as narrow as 24″ wide (standard staircases range between 30″ – 32″ wide). 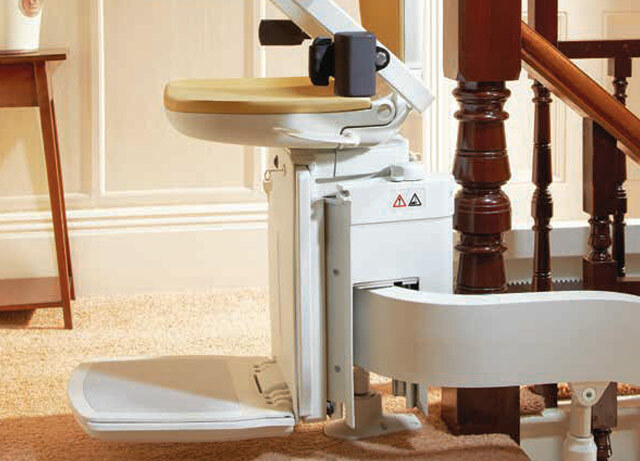 When the stairlift is folded up, it measures at only 12.5″ in depth. Versatile bespoke track: Designed and manufactured in Britain by one of the original stairlift manufacturers, the Brooks 180 runs on a slimline, durable single modular rail track which is designed and built to the exact specification of your staircase. It’s a versatile stairlift and can be fitted to a number of different staircase shapes and sizes, including: internal, external, 90° bends, 180° turns, multiple bends, fan shaped stairs, square landings, 180° wrap round starts and many more configurations. Safety first: The stairlift comes fully equipped with pressure sensitive safety plates, limit sensors, dual electronic and mechanical braking systems and a safety belt harness. You can be sure that every journey up and down the stairs will be safe and hassle free. 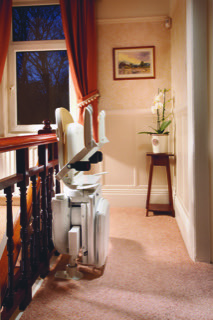 Comfort: The Brooks 180 curved stairlift offers super comfort, featuring comfortable upholstery, smooth stop and start function, easy to use controls and near silent operation all as standard. 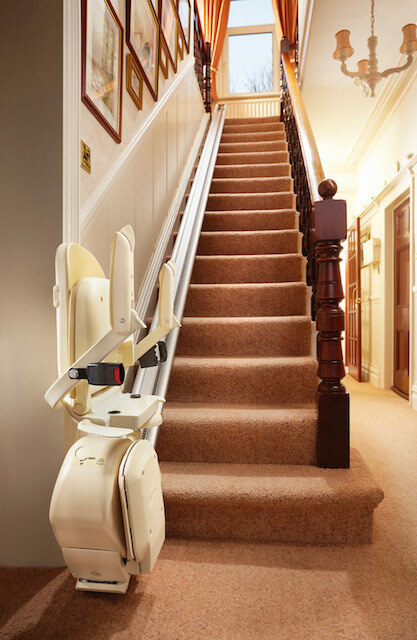 Adaptable functions and features: The stairlift can be fitted with array of features suited to the user’s requirements for ease of use. 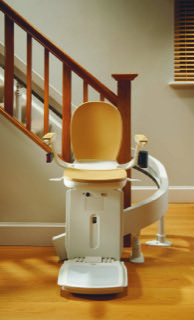 Functions such as automatic swivel seat, large foot rest and hinged track system can all be added to this stairlift. Practical solution: The Brooks 180 curved stairlift can be fitted on practically any curved staircase. Its slim, attractive rail attaches directly to your stairs (not the wall), so there’s no damage to your home. Also because the modular rail track is easily assembled this enables faster delivery from order. 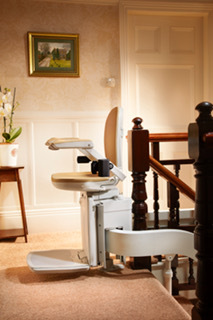 Installation is quick too – we can have the stairlift fully installed and ready to go within 2-3 hours. The Brooks 180 can be folded up against the wall anywhere along the stairs to free up space. When folded. The safety edges are located around the footrest and carriage. 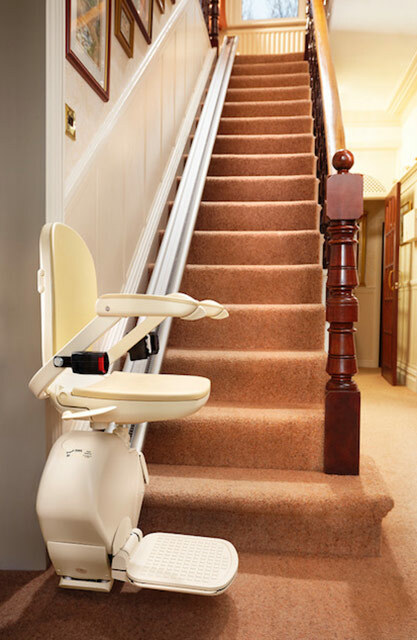 They stop the stairlift instantly if it encounters any obstructions along the stairs. The modular rail can be fitted to staircases that feature: 90° bends, 180° turns, quarter landings, multiple bends, fan shaped stairs, square landings, 180° wrap round starts, 360° shaped staircases – external or internal side. The Brooks 180 comes fitted with a safety belt as standard. This can be used for extra safety whilst travelling along the stairs. 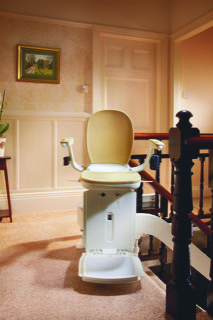 The easy to use controls enable the user to control the stairlift up and down stairs by the press of a button. They are located on the end of both arms. The wireless remote controls enable the user to call and send the stairlift up and down the staircase. These are especially handy when 2 people are using the lift. The swivel lever is located in easy reach on either side of the chair. When pushed downwards it unlocks the swivelling mechanism. The swivel seat enables easy access to the landing area. Once swivelled, the seat locks in place allowing you to get out of the chair securely.